INCLUDED: Artistic Perfect Pressing Sheet 12.5x30" for EP100 Ironing Board 25x9"
Made in Europe, 24.5x9" Pressing Board, 11 Ply Finnish Birch, 1000 Watts, 392°F Heat Plate, Variable Temperature Dial, On Off Switch, Auto-Off with Buzz, 23 Lbs, Water Spray Bottle Creates Steam at up to 400°F from the hot iron shoe surface. Only ironing board clam shell press available with solid upper iron heat sole plate with no holes, all heat! No steam holes in heat shoe that can show up as bubbles on pressed fabrics, appliques, fusible stabilizers and interfacings, or on heat transfers. Dry Press which you can add water spray to create steam. 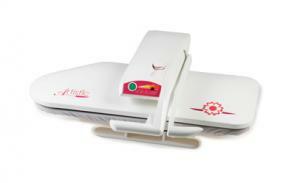 Up to 392 degree heated surface for fusing appliques and stabilizers as well as ironing garment fabrics. The Artistic Press will cut your ironing time in half and take the drudgery out of ironing. Time-Saving – Ironing surface is 10 times larger, and you get twice as much done! You can press up to 8 layers at once! Great Value – Excellent price for Swiss designed* full size, high quality press. Safe – Electronic safety power cut shuts off after 10 seconds in closed position – no scorched laundry! 15 Minutes Heat Up Time to Cotton Linen setting, Only 5 Minutes to Silk setting. Pressing pad for those hard to reach spots or quick touch-ups. Weighs less than 25 lbs. No more trips to the dry cleaner for those perfect edges. Even T-shirts with decorations can be pressed to your satisfaction. You will be pleased with the crisp look of your collars, cuffs, and pockets. Pad included to help you get to those hard to reach places. Presses pillow cases and sheets like new. You will never use anything else to press these sheets again. See how the sleeve seam fits the angle of the board for perfectly pressed sleeves every time. You never have to worry about ironing around buttons or having them break off at the cleaners. They sink into the deep pad! You ask, what about the collar? See how perfectly it fits on the press board. See how the whole crotch fits on the board! Notice how the pant leg fits nicely on the press board. Simply bring the press shoe down and you have a crisp pleat. No dry cleaning involved. Large items such as Grandma's table linens are a breeze with the press and the large open area in the back for convenient storage while pressing. How to use the Artistic Press. This video will show you how to use the innovative Artistic Press! Click HERE to See Videos and Instructions on Other Higher Priced Swiss Design Elna Presses, all made in the same factory as our Janome Artistic EP100 Ironing Press in Turkey See Elna Press Video from mid 1900's in French. Elna presses have been around for a long time. Do you have a press that is able to sustain pressing with starch at a heavy level, and if so what are the price ranges? If you use spray starch and a cotton press cloth in between the hot iron shoe and the fabric, it would not be a problem with any press we sell. 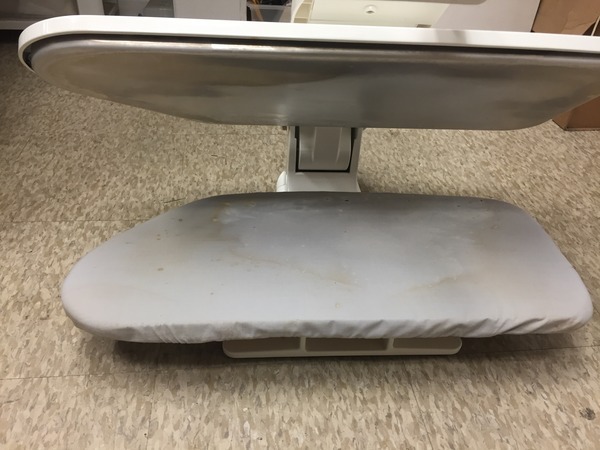 Without the press cloth on top of the garment, the starch would build up on the iron shoe and it is hard to clean off, even with Iron Off which is like Easy Off for cleaning ovens.